Is working out at the gym better for you than working out outside? As college students, we dread weight gain or any sign at all that we’re getting any bigger than we used to be. If you’re like me, you’ll look for the easy way out. I’m always looking for the “quick fix” when it comes to exercising. I love working out at the gym because I find working on the machines more entertaining and effective than when I’m left to my own devices. But then, taking a run outside has its advantages too. Which one is really better? 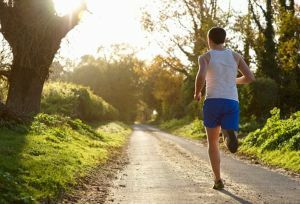 In eleven randomized and non-randomized trials that recorded information from 833 adults, exercising outdoors showed to be the reigning champion. Researches found that working out outside in natural environments made subjects feel more refreshed, increased energy and decreased feelings of depression and anxiety. But, did these studies actual measure the fitness of the subjects? Subjects may FEEL more refreshed, but are their bodies physically improving alongside their state of mind? And, were all subjects generally the same age or did the ages vary? Exercise amongst young adults versus those who are middle aged most certainly could vary. And how do we know how rigorous subjects are exercising in the gym? This could very from person to person. Not to mention, the environment that a person is surrounded with. If it’s freezing cold outside in Pennsylvania it’s debatable as to how happy a person would feel exercising outdoors than if it’s 72 degrees and sunny in California. Personally, I would much rather be exercising in 72 degree weather. In comparison, a study performed on older adults found that those who exercised outside had a tendency to work out for longer periods of time. Subjects were on average around 66 years old or older. Those who worked out outside – mainly through walking – were more active than those who worked out indoors, on average spending 30 minutes more exercising. It’s clear that this study as well cannot be applicable to the total population as it only gathered information from adults in the later years of their life. Will working out outside motivate me to work out more as opposed to working out inside? Is it strictly psychological? Scientists haven’t found any concrete evidence that working out indoors is worse for you than working out outdoors. Since actual physical fitness was not measured I don’t think we can draw any significant conclusions as to which is more advantageous. Bottom line, if you’re looking for a short cut to that summer beach bod, working out indoors is just as effective as working out outdoors, you might just be a little happier if you’re outside. Although, your outside surroundings could affect how you feel as well.